Before the Christmas rush takes over for another year, we thought it would be helpful to fill you in on some of Books+Publishing’s activities in 2017 and plans for 2018. In 2017 we published 1328 news stories and 261 reviews. You can find a list of the most popular news stories and reviews from the past year here. Interestingly, stories about publishers’ acquisitions featured particularly highly. This is an area of coverage that we’ve been expanding over the past year and we will continue to do so in the future. We’ve also started bringing news of Australian acquisitions, rights sales and award-winners to international publishers, agents and scouts with the launch of our monthly Think Australian newsletters, which currently reach an audience of over 7000. Publishers who are keen to increase their international profile or promote a particular title through Think Australian should get in contact with our advertising manager Fi Tunnicliff. This year, among the many feature articles published in our magazine and on our website, we brought you a regular column from UQP nonfiction publisher Alexandra Payne, who covered subjects as diverse as feminist publishing, transmedia narratives and burnout in the book industry. We introduced you to some of Australia’s most influential book bloggers through our ‘Book blogger spotlight’ series. (Next year, we turn to podcasters.) And currently, we’re asking booksellers across the country to share their predictions for Christmas bestsellers and ‘surprise sellers’. Our final Weekly Book Newsletter for the year will be published on 13 December and will return on 10 January 2018. The first Books+Publishing magazine for 2018 will be out in early March and will include features on digital marketing, multi-genre authors and horror books in children’s publishing. You can find our editorial deadlines for 2018 here. If you have any news or feature ideas that you’d like to share with us, please email the editorial team at books.publishing@thorpe.com.au. Fi Tunnicliff has begun taking ad bookings (including ad package deals) for 2018. Magazine covers and Book Buzzes have been particularly popular so it’s worth getting in early to avoid missing out. On a more personal note, after relocating to Oxford in September, I will be going on maternity leave at the end of November, and I’m thrilled that Jackie Tang will be taking over as editor-in-chief. From December, you’ll find me shopping for children’s books at Blackwell’s and generally spruiking Australian books and authors in the UK. The entire team at Books+Publishing wishes everyone a merry and bookish Christmas. 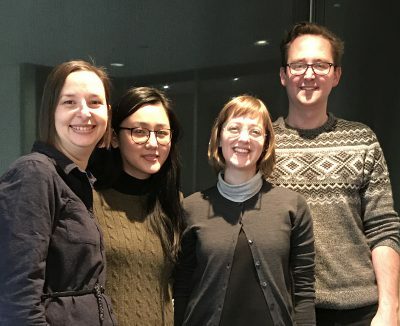 Pictured above: Andrea Hanke, Jackie Tang, Sarah Farquharson and Brad Jefferies. Missing from the picture are: Andrew Wrathall and Fi Tunnicliff.